Anna Kendrick is an American actress and singer who became a Broadway star and conquered cinematography later. Movie lovers know her for the roles in Up in the Air, Twilight, Pitch Perfect, Mr. Right, Life After Beth, and so on. Anna was born in the north of the United States, New England, Portland. Her mother, Janice Cooke, worked as an accountant, and the father, William Kendrick, taught history at school and later got engaged in finances. Anna had an elder brother, Michael Cooke Kendrick, who also became an actor. When the girl was ten, the parents took her for auditions in New York. During the casting, she realized which talents she should develop; two years later, Anna started appearing on the stage of many famous theaters in Broadway musicals including High Society and A Little Night Music. The child artist was nominated for three prestigious theater prizes: the Drama Desk, Theater World Award, and Tony Award: she became the youngest actress nominated for these awards. For the next five years, Anna Kendrick was giving Broadway performances and then focused on cinematography. In 2003, the young actress debuted in the youth music series Camp. Later on, she appeared in the musical Viva Laughlin and the light melodrama Rocket Science. In 2008, Anna earned her first fame. She participated in the romantic vampire saga Twilight where she played the friend of Kristen Stewart’s character and got the first lead role in the musical tragicomedy The Marc Pease Experience. The drama Up in the Air with George Clooney and Vera Farmiga brought even more fame. The fragile young woman was a success. This role brought her the nominations for the Academy Award, Golden Globe, Screen Actors Guild Awards, and BAFTA. Besides, the artist was named the Rising Star at the 21st Annual Palm Springs International Film Festival. Her career started developing rapidly, and new projects followed. In 2012, Anna Kendrick played the main female character in the crime action movie End of Watch. The musical comedy Pitch Perfect based on Mickey Rapkin’s novel Pitch Perfect: The Quest for Collegiate A Cappella Glory brought another lead part. Anna played a new student, Beca, who joins the youth group The Barden Bellas. With the new group member, The Bellas enters the student competition and challenges the boy group opponent. Brittany Snow and Rebel Wilson became Anna’s movie partners. In 2013, the actress showed her music talent outside the movie: she created the music video for her song “Cups” (“When I’m Gone”). In 2014, the British parody horror with melodramatic elements Life After Beth came out. Anna Kendrick took one of the most significant roles. The same year, the actress starred in the American romantic melodrama The Last Five Years. The movie was a screen adaptation of a popular musical originally staged on Broadway. 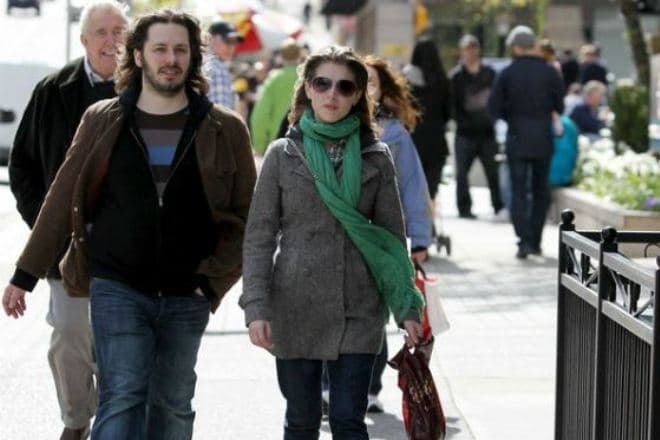 The main character, the beginning actress Cathy Hiatt (Anna Kendrick), is married to a famous writer. The movie tells the story of the actress’s ambitions and jealousy that destroy the young people’s marriage. In a year, Anna came back to the role of Beca in the sequel Pitch Perfect 2 where The Barden Bellas apply for an international competition. The American team has never won a victory, but Bellas do not lose their courage. Anna Kendrick is a workaholic; she cannot imagine her life without working on scenarios, rehearsals, and future shooting discussions. It might be one of the reasons the woman is single. Anna’s longest romance lasted for four years. At the movie set of Scott Pilgrim vs. the World, the actress met the British director and scriptwriter Edgar Wright. The couple was dating until 2013. Long time apart and distances influenced their feelings: the lovers were separated by the ocean. Wright continued to work in London, and Kendrick was not ready to give up her Hollywood career. Still, Anna and Edgar remained on friendly terms after the break-up. Fans also believed the actors Jake Gyllenhaal and Robert Pattinson were seeing Anna. However, the young woman denied the rumors about those romances. The actress does not keep per personal life secret. She has a verified Instagram account and regularly posts photos from movie sets and meetings with her friends. She does not hesitate to show her home photos or selfies; still, she remains stylish. 2016 brought the actress many lead roles in comedies. In the comedy action movie Mr. Right, Anna Kendrick played Martha, the young woman who became a killer’s lover. The same year, Anna personified Jillian Stewart, the main character of Get a Job. The movie Mike and Dave Need Wedding Dates starring Anna tells the story of two friends invited for a wedding. They have no girlfriends to go with and decide to meet their future partners via the Internet. Suddenly, their personal ads go viral and make an unexpected effect. The actress does not limit herself with comedies. In 2016, Anna played Dana in the crime drama The Accountant. The movie is set in the world of financial operations and schemes. An autistic math genius (Ben Affleck) audits false accounting of famous criminals. To create the image of a law-abiding employee, the man begins to work for a legal company with no financial secrets, yet he has to face the major problems with his official job. 2016 was marked with the role in the music video “Can’t Stop the Feeling! First Listen” by Justin Timberlake. In 2017, Anna played Beca Mitchell again in the third part of the music movie Pitch Perfect 3.